Click on a topic for the corresponding tutorial. Click the topic again to collapse the view. To search by legal description, click the Subdivision Search tab on the valuation lookup page. 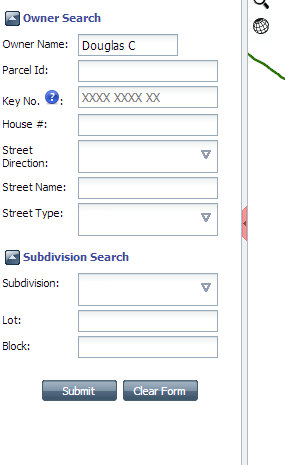 Type the subdivision name, and enter the lot and block numbers below. Search by Parcel ID or Key No. You may search using a Parcel number in the format 1234567890. You may search using a Key Number in the format 3456 7890 12. You may enter part, or all of the address you are looking for into the address search. 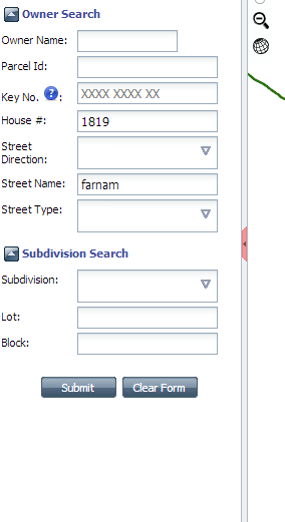 For example, if you are looking for 1819 Farnam St, you can use the fields House # (1819), and Street Name (Farnam), or you could simply use the House # (1819) field. You may enter as little information as you want on the address search. 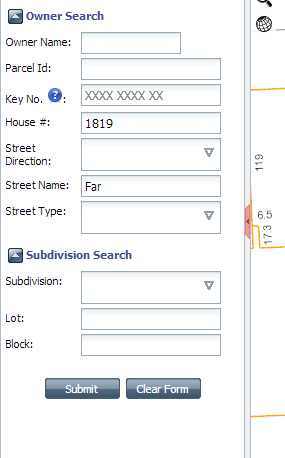 If you use the previous example, you could enter House # (1819), and Street Name (Far), and still get the desired result. If you are having trouble finding a property, use less information to broaden the search. The sales search is designed to allow a user to search for any valid Real Estate sale in Douglas County from 2000 to present. You may use as much or as little criteria as you would like. As with most searches, if you use more search criteria, fewer results will be found. This search is limited to a maximum of 500 results per search. Below is a list of how each criteria field affects your search. If you would like to search the for sales in the entire county leave this box blank. 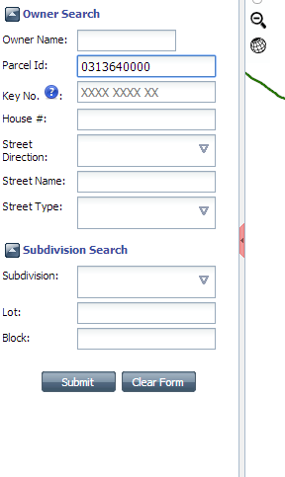 Otherwise, you may select multiple subdivisions by typing the subdivision name and clicking each subdivision you would like to search. When you click these fields, your web browser will present you with a calendar. First set the month and year, and select the day last by clicking on the corresponding number. Sale dates go from 2000 to present. Use drop down box to choose if you are looking for lots that have been built on, or vacant lots without buildings or pavement. You may enter a desired sales price range in order to return only sales within the specified range. Do not include dollar signs or commas in these fields. You may also leave these fields blank if you do not wish to filter by sales price. Size refers to the size of the houses or buildings that will be returned in the search. If you are doing a search for vacant parcels, select Acres as the unit of measurement. If you are searching improved parcels, use SqFt as your unit of measurement. As with sales price, do not use commas in these fields. If the size of the parcel or improvement does not matter to you, you may leave these fields blank, and all sizes will be reflected in your search results. You may enter a range of years here to return sales of parcels that have houses or buildings built within a certain timeframe. 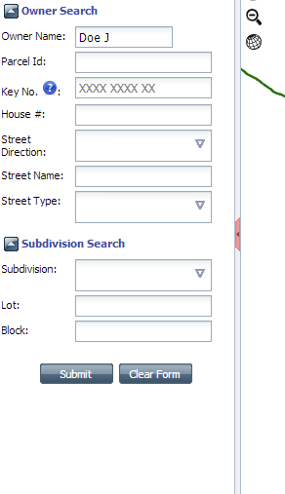 If you are doing a search for vacant parcels, always leave these fields blank. If the year a structure was built does not matter to you, you may leave these fields blank, and all available years will be reflected in your search results. Style name refers to the type of building on a particular parcel. You may select multiple styles by clicking a style name in the drop down box. If style of a building does not matter to you, you may click the select all styles checkbox. Account type is the type of property you wish to search for. If you are not sure what account type you are looking for, you may leave this blank, and all account types will be reflected in your search results. You can narrow your search to a specific zip code using this field. You can narrow your search to proximity of a certain parcel by entering a parcel ID in the Of field, and selecing a set number of feet, meters, or miles from the Distance and Units fields.